Size of this preview: 800 × 576 pixels. Other resolutions: 320 × 230 pixels | 640 × 461 pixels | 1,024 × 737 pixels | 1,280 × 922 pixels | 1,571 × 1,131 pixels. 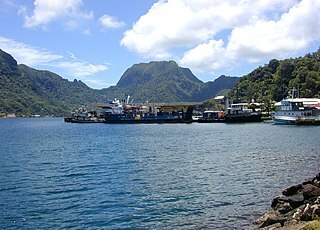 English: Portion of the dock area at Fagatogo, Pago Pago Harbor, American Samoa with Rainmaker Mt. (Pioa Mtn.) in the background.